प्लेटो व सोक्रेटिज नापं वय्‌कःयात पाश्चात्य दर्शनया दक्ले महत्त्वपूर्ण आदि विचारकया कथं हनिगु या। पाश्चात्य दर्शनयात व्यवस्थित रुपय् यंकिम्ह दक्ले न्हापांया मनु वय्‌क हे ख। Aristotle's views on the physical sciences profoundly shaped medieval scholarship, and their influence extended well into the Renaissance, although they were ultimately replaced by modern physics. In the biological sciences, some of his observations were confirmed to be accurate only in the nineteenth century. His works contain the earliest known formal study of logic, which was incorporated in the late nineteenth century into modern formal logic. 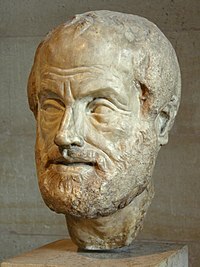 In metaphysics, Aristotelianism had a profound influence on philosophical and theological thinking in the Islamic and Jewish traditions in the Middle Ages, and it continues to influence Christian theology, especially Eastern Orthodox theology, and the scholastic tradition of the Roman Catholic Church. All aspects of Aristotle's philosophy continue to be the object of active academic study today. Though Aristotle wrote many elegant treatises and dialogues (Cicero described his literary style as "a river of gold"), it is thought that the majority of his writings are now lost and only about one-third of the original works have survived. This page was last edited on १३ मे २०१४, at १६:५४.